Ivy Cottage01263 715779work01603 870304fax Self-cateringThis quaint end-of-terrace cottage is situated in the heart of Binham; a pleasant village providing local amenities. The exterior flint and brick facade is in keeping with traditional Norfolk cottage design. The interior had modern utilities, comfortable furniture and a homely aesthetic, allowing guests to relax and put their feet up after a long and memorable day in the beautiful Norfolk countryside. 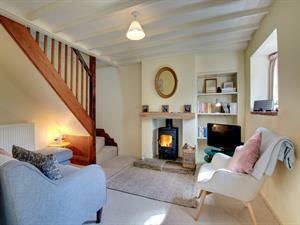 This quaint end-of-terrace cottage is situated in the heart of Binham; a pleasant village providing local amenities. The exterior flint and brick facade is in keeping with traditional Norfolk cottage design. The interior had modern utilities, comfortable furniture and a homely aesthetic, allowing guests to relax and put their feet up after a long and memorable day in the beautiful Norfolk countryside.